Artist impression of transmitter site. ©National Institute of Polar Research (NIPR), Japan. During the EISCAT_3D Preparatory Phase project, which was funded by the 7th Framework Programme of the European Commission and which ended in September 2014, the science case for EISCAT_3D was developed by the project's work package 3. The final version of this document was published in September 2014 and is available on the EISCAT_3D web site. 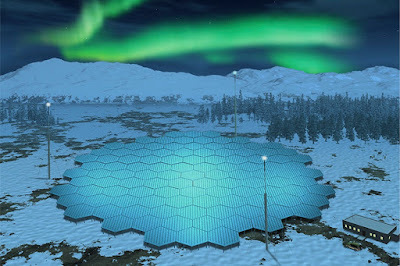 The science case for the EISCAT_3D radar, by Ian McCrea, Anita Aikio, Lucilla Alfonsi, Evgenia Belova, Stephan Buchert, Mark Clilverd, Norbert Engler, Björn Gustavsson, Craig Heinselman, Johan Kero, Mike Kosch, Hervé Lamy, Thomas Leyser, Yasunobu Ogawa, Kjellmar Oksavik, Asta Pellinen-Wannberg, Frederic Pitout, Markus Rapp, Iwona Stanislawska and Juha Vierinen, Progress in Earth and Planetary Science, 2:21, doi:10.1186/s40645-015-0051-8 (29 July 2015; link to paper). 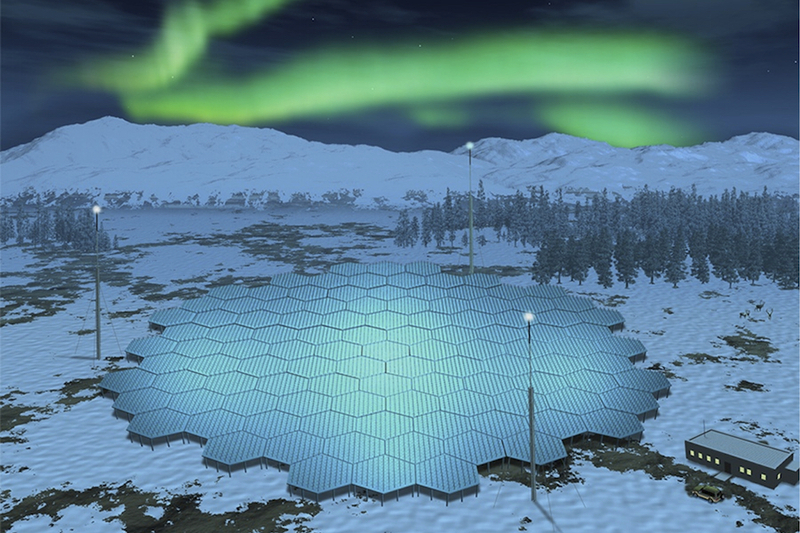 Image: Artist impression of a possible EISCAT_3D central site, courtesy of National Polar Research Institute (NIPR), Japan. Two Sunsets Today in Sodankylä! Two sunsets on the same day? For real? This is something that never happens at midlatitudes, but which occurs once a year in places which are located far enough north (or south, for the southern hemisphere). This is the case today in Sodankylä, as advertised in the almanach published by the University of Helsinki. 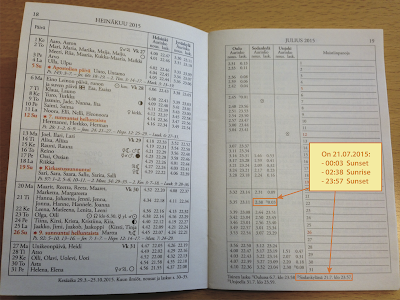 The July pages of Yliopiston Almanakka 2015, by the University of Helsinki. Of course, between those two sunsets today, we do have a sunrise. What happens is that, since 15th July, when the midnight sun period ended, the sun has been setting after midnight every day, for a short while below the horizon. 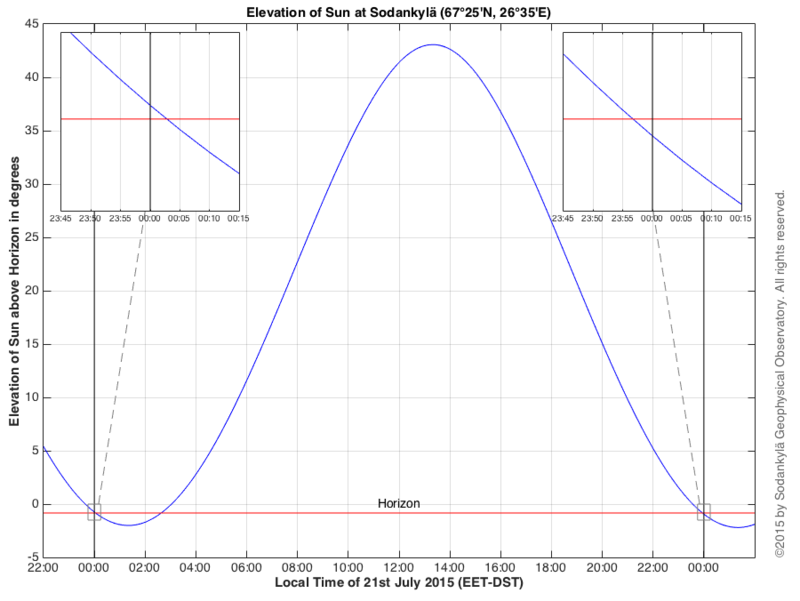 This is due to the fact that Sodankylä is located at 26°35' east longitude, which means that local solar midnight happens at 22:14 UT (since 15° in longitude corresponds to one hour). As Finland is now in summer time (i.e., UT+3:00), the solar midnight in Sodankylä therefore occurs at 01:14 LT. In other words, sunrise and sunset are on average symmetric with respect to 01:14 LT (00:14 LT in winter time)1. There is therefore a period during which, every day, sunset occurs after midnight, and thus practically before sunrise. After the end of the midnight sun period, the sunset time moves gradually from near 01:10 towards 00:00, until the day when it crosses this critical boundary. And indeed, last night we had a first sunset at 00:03 local time, and the sun rose this morning at 02:38. It will set again tonight at 23:57, and that is why we have two sunsets today in Sodankylä. 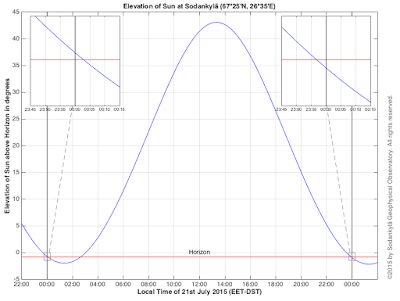 Plot of the solar elevation on 15 July 2015 in Sodankylä. The horizon line (in red) is shown slightly below 0° elevation since the sun is considered set when its upper limb is below the horizon (the blue curve refers to the centre of the sun). Figure made by T. Ulich. In a similar way – and because there must be the same number of sunrises and sunsets over a complete year –, there is a day when there is no sunset at all. Indeed, before the midnight sun period starts, sunset occurs later and later in the evening, until it ultimately moves from typically ~23:56 to ~00:03, skipping a day in between. This happened on 24 May this year in Sodankylä. Interestingly, one may notice that these funny sunset patterns are not limited to latitudes beyond the polar circle, and not even to midnight-sun latitudes2. The almanach indicates that there were two sunsets on 6 July in Oulu, although Oulu is too far south to be in the midnight-sun area. This can be explained by the fact that there is no need for a midnight sun period for this phenomenon to occur; all that is needed is nights which are short enough to have the sunset taking place after midnight at least one day. The further west in the time zone, the more south it is possible to go to find a suitable place, because the local solar midnight is shifted later with respect to the official local time. Empirically, I could find that the southernmost populated place in Finland where two sunsets can be observed on the same day would be Rahja (500 inhabitants, about 15 km south from Kalajoki). Perhaps they should advertise it on the official webpage of the village (Rahjankylä); there might be potential to attract tourists. 1In practice, the exact local solar midnight varies throughout the year due to the ellipticity of the Earth's orbit. It follows the so-called equation of time. 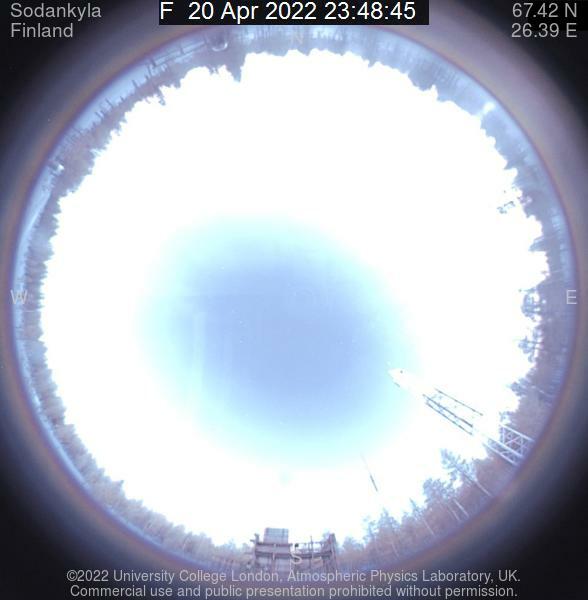 These days, in Sodankylä, the actual local solar midnight is at 01:20 LT.
2Those extend about 0°50' below the polar circles, because of the combined influences of the apparent width of the sun (see the plot caption) and of atmospheric refraction. INTRODUCTION: This conference is part of international workshop (IPA2015) organized to bring together participants from Eastern African region and those from other regions of the world to share knowledge and latest research problems and solutions related to Inverse Problem. The conference will comprise of series of paper and poster presentations. SCOPE: Relevant topics include but are not restricted to: epidemiological modeling, chemical reactions, data assimilation, Bayesian uncertainty, financial mathematics, stochastic processes, and dynamical models. 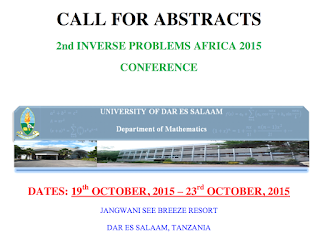 SUBMISSION OF ABSTRACT: Send the abstract either in PDF or MS Word format via e-mail to: ipa2015tz@gmail.com. abstract acceptance notification by 30th SEPTEMBER, 2015. CONFERENCE VENUE: The conference will be held at JANGWANI SEA BREEZE RESORT which is located in Dar es Salaam city, Tanzania, along Mbezi Beach on clear white sands. TRAVEL: Dar es Salaam City is served by Julius Kambarage Nyerere International Airport (JNIA). Jangwani Sea Breeze Resort is approximately 16km from JNIA. Local organizing committee will arrange transport for participants. Provide Local Organizing Committee with the travel plans as soon as they are finalized. ACCOMMODATION: There is a variety of choice for accommodation in Dar es Salaam. The local organizing committee has selected hotels that workshop participants will stay. The hotels names will be posted http://maths.udsm.ac.tz/ipa/index.html. Currently, we recommend Jangwani See Breeze Resort whose charge is 69 USD per night. A participant has a right to choose her/his own preferred accommodation. Hotel charges for accommodation range $50 to $300. 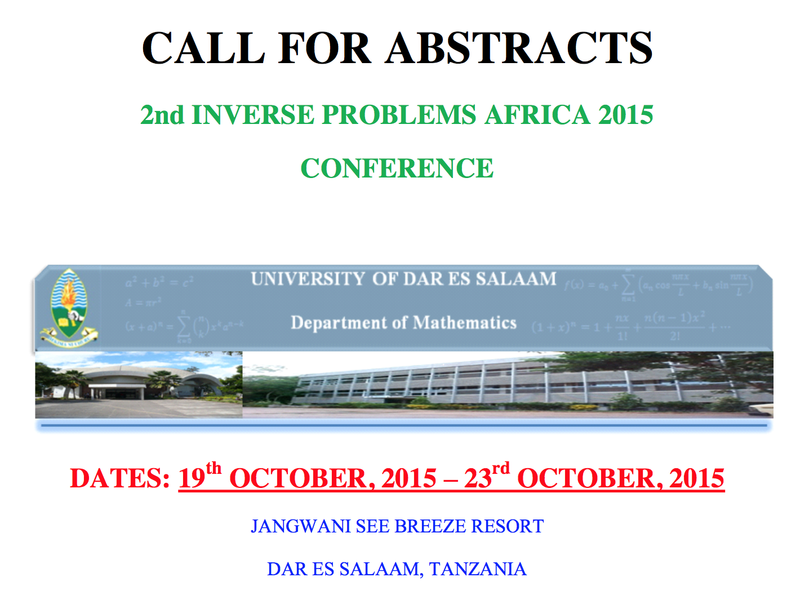 for participation should be sent, by email, to the email address ipa2015tz@gmail.com. There will be a registration fee of US $200 for non-members of the CIMO/HEI-ICI. Payment of the registration fee will be upon arrival. INVITATION LETTERS: If you require visa to enter Tanzania, write to ipa2015@gmail.com. We will issue the invitation. Increased levels of carbon dioxide and methane are well known to warm the atmosphere. However, this phenomenon is predicted to cool the thermosphere, i.e. the upper atmosphere. 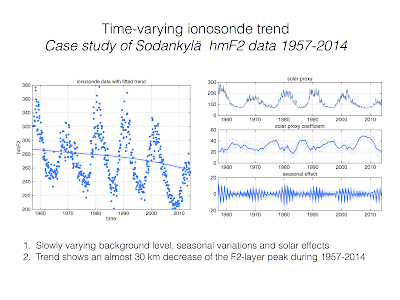 In order to study this phenomenon, we have considered Sodankylä hmF2 data (obtained from ionosonde data analysis) with dynamic linear models and tried to estimate the long-term trend of the so-called F2-layer peak. In our new method, we use an additive model composing of a slowly varying background level (i.e. the long-term trend), seasonal variations and solar effects (F10.7 used as a solar proxy). The nice thing about dynamic linear models is that the analysis output gives us estimates for all the model components with error bars. Also the seasonal variations can be seen to be modulated by solar activity. We conclude that we see an almost 30 km decrease of the F2-layer peak during 1957-2014. We also note that the trend is not linear. However, as this is a 'point measurement', we do not conclude anything about global trends - these need to be studied in subsequent papers! 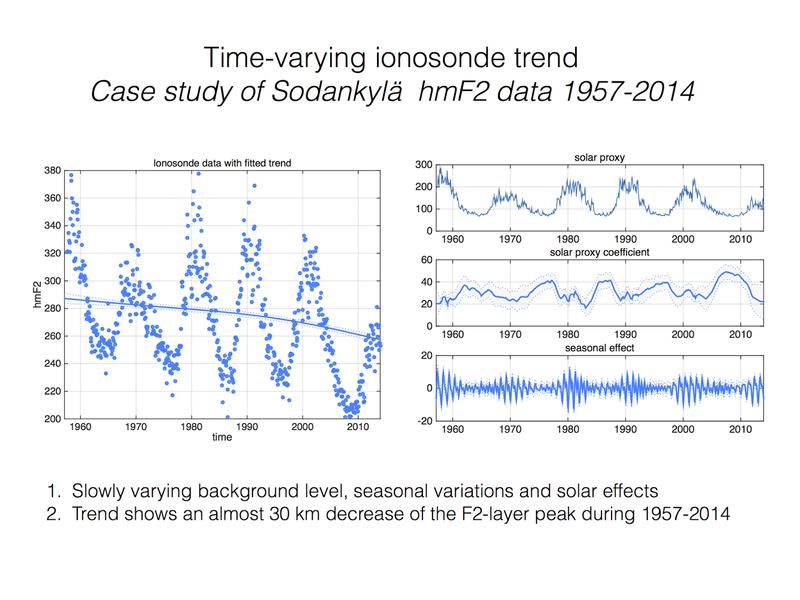 L. Roininen, M. Laine and T. Ulich, Time-varying ionosonde trend: Case study of Sodankylä hmF2 data 1957-2014, Journal of Geophysical Research - Space Physics, (2015) doi:10.1002/2015JA021176. This paper is part of a special issue titled "Long-term Changes and Trends in the Stratosphere, Mesosphere, Thermosphere, and Ionosphere, JGR-Atmospheres/Space Physics, 2014". 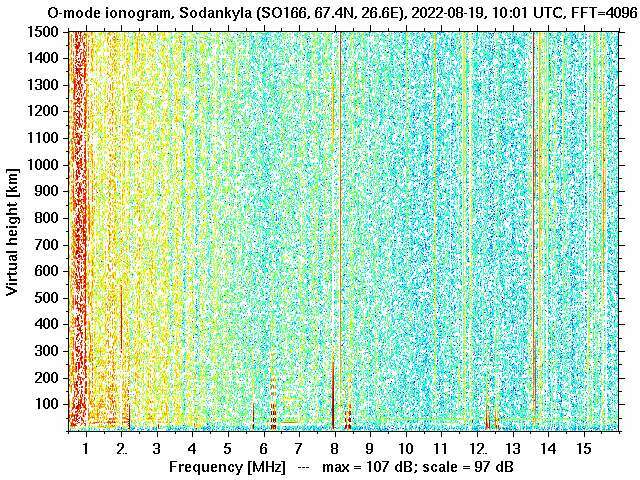 We discuss trend analysis of non-stationary ionosonde hmF2 time-series measured at Sodankylä Geophysical Observatory (67.4$^\circ$N, 26.7$^\circ$E), Finland, 1957-2014. We model the hmF2 with a dynamic regression time-series model with the following components: a slowly varying background level, seasonal variations and solar effects. We analyze the time-series with a dynamic linear state-space model. Such an approach allows model components to vary in time, allowing us to study the dynamic stochastic nature of the underlying long-term trend. This feature is lacking in most time-series models used in atmospheric and environmental long-term trend analyses. Our objective is to understand the long-term hmF2 trend with respect to increased levels of carbon dioxide and methane in the atmosphere. Based on model estimates, this phenomenon is predicted to cool the thermosphere, and, leads to decrease of the altitude of the so-called F2-layer peak. After accounting for the effects of solar activity variations on the data, we see that the estimated trend shows an almost 30 km decrease of the F2-layer peak during the observation period. The decrease of the peak during 1990-2010 is significantly greater than during earlier observation period.